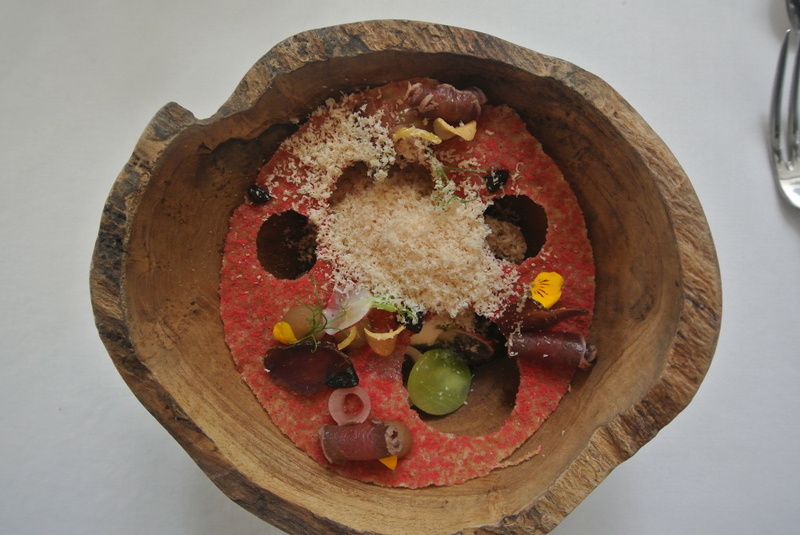 On any regular day I would not be able to afford a meal at the esteemed restaurant, La Colombe but restaurants in Cape Town tend to get a little quiet in the off-season so they invented a little thing called the winter lunch special. Though they try to make this as inconvenient to your working day as they possibly can (it always has to be a weekday and during lunch), it is an excellent opportunity to try those fine-dining establishments that would otherwise be out of your reach. 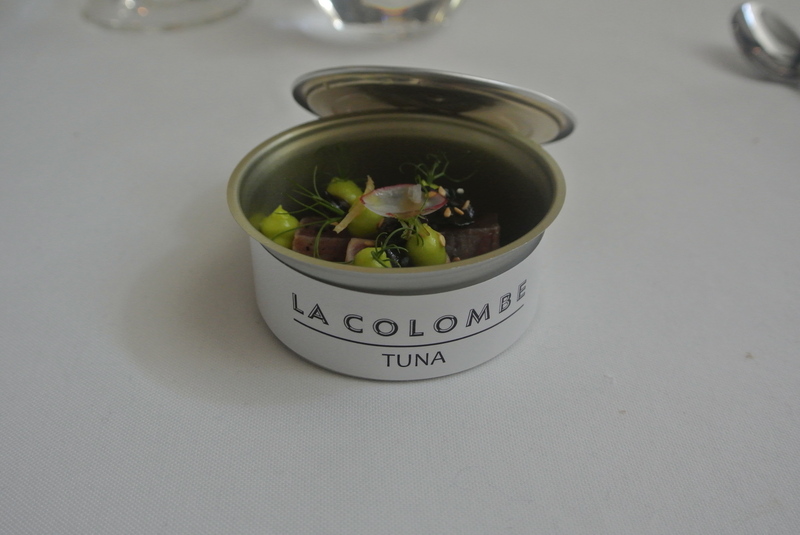 On Monday I carved out my time and booked (a week in advance at least) a table at one of Cape Town’s most established fine-dining restaurants, La Colombe. Having never been, I kept an open mind and an empty stomach. La Colombe is situated in the Constantia Neck pass so it feels like you are deep in the wooded countryside and not a 10 minute drive from the city center. Upon arriving you are greeted with the most adorable little indoor moss garden, where, nestled upon lily pad plates lies your palate cleanser. A sweet yet tart green apple jelly contained in a coconut sphere that bursts when you bite into it. Having worked in a kitchen myself I can understand the amount of work that would go into this small spherical miracle so I was already impressed. We were seated next to a roaring fire in a very clean and modern dining room hearing the sounds of our food being prepared floating through from the open kitchen. Our bread arrived and it was quite an exciting act. A chef came out to serve it and explain each of the elements with flourish. A simple bear and black-currant bun was served alongside a delicious Mediterranean spiced lamb-butter that you soaked up with the bread. 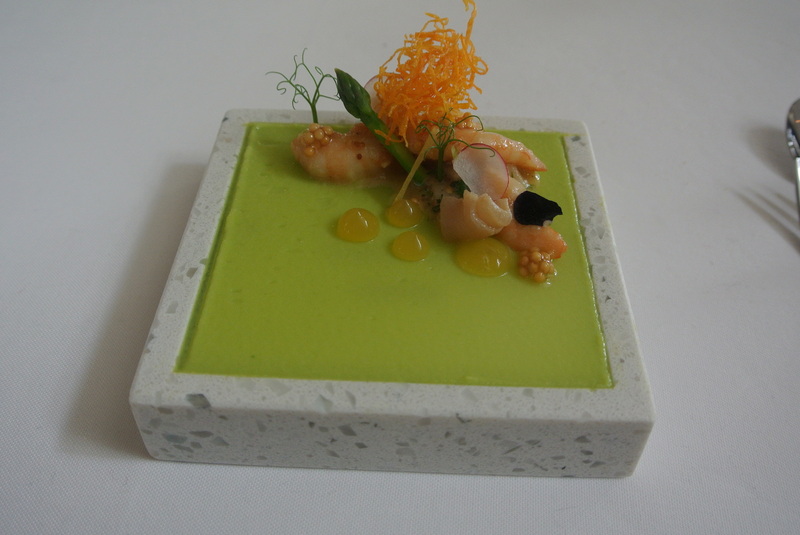 Next we had an asparagus and prawn amuse buche which was quite good and beautifully plated. Our starters arrived. I had a grilled quail with a sweet mousse and miso foam, the other started option was a springbok carpaccio with foie gras. The combinations were all very interesting and the elements very different. We then received a small can of tuna. Such a clever idea with the presentation of the dish and the elements were purposefully kept a mystery so that you could guess the flavors. I found it was quite a sweet tuna ceviche with a spicy avocado mousse. For the main course we had beef prepared 3 ways and all of it was cooked to perfection. For this course we could also choose our own steak knife from their collection of beautifully hand-crafted knives. The final course, and the one I was admittedly looked forward to the most, was dessert. I ordered the strawberry with white chocolate cremeaux and matcha-rosehip sponge. I really enjoyed the plating once again but I found the flavors didn’t quite go together. The deconstructed cheese board was the other option and it also looked incredible. Though some of the dishes didn’t live up to my expectations, everything was so stunning that I left feeling full and impressed. Eating at La Colombe is really such an incredible experience but it is quite pricey so I would definitely recommend taking full advantage of the winter special if you have the opportunity.